Book clubs have increased considerably in popularity over the last few years. Oprah’s picks acted as a catalyst, and now nearly every book store has a section devoted to them. With that in mind, I picked three books with a strong female lead that your book club may have overlooked. In the Land of Invisible Woman is the memoir of Qanta Ahmed, a Western-trained Muslim doctor. When her visa to remain in the United States is unexpectedly denied, Ahmed impulsively accepts a position at a hospital in Saudi Arabia. A self-described secular Muslim, Ahmed sees this offer as an opportunity to delve deeper into her heritage and to learn more about the Muslim faith. Ahmed admits that she is naive regarding the complications of living in the Saudi Kingdom. Though aware of the strict Sharia law, she finds that her western medical training left her unprepared for situations such as treating a woman who is comatose but must remain veiled or trying to accurately assess a woman’s heart rate through her abaya. Angry at what she sees as female oppression, she begins to see ways in which women have learned to turn their oppression into their own form of self expression, displaying their beauty through colorful fabrics and intricately embroidered patterns. In addition, the women take great care to ensure their makeup is perfect beneath their veiled faces. They are determined to allow themselves to feel beautiful for their own sake even if no man beyond their husbands will see the results. As a reader, I found myself fascinated by this autobiography. Ahmed’s descriptions of the people she met left me feeling as if I were meeting them alongside her. Her experiences of rediscovering her Muslim faith through a pilgrimage to Mecca reminded me of accounts of Jewish and Christian journeys to Israel. Although the narrative was choppy in places and several events which seemed important were never elaborated on, I did thoroughly enjoy In the Land of Invisible Women and seeing Ahmed’s experiences through her eyes. 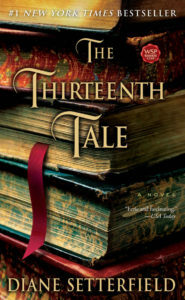 The Thirteenth Tale by Dianne Sutterfield follows the paths of Vida Winter, a famous but reclusive novelist, and Margaret Lea, a spinster and amateur biographer who has devoted her life to her father and his book shop. Winter has given only a handful of interviews in her career, all of them full of self-admitted lies or fanciful stories. Lea has grown up working in her father’s shop, experiencing very little of life outside of books. One day when she is a child of ten years, she discovers that she had been born as a conjoined twin and that her sister had died. This discovery separates her even further from her already distant mother and explains the sense of incompletion and longing Lea has always felt. Years later, a grown Lea receives a letter from Winter requesting Lea’s services as a biographer. While mulling over this decision, Lea decides to read one of Winter’s books called Thirteen Tales of Change and Desperation only to discover that the thirteenth tale is missing. Lea quickly agrees to be Winter’s biographer in hopes of solving the mystery of the missing tale. Along the way, Lea begins to uncover not only the secrets of Ms. Winter’s past but also of her own. Written in the same vein as classic gothic literature, fans of Jane Austen or the Bronte sisters will very much enjoy The Thirteenth Tale. I found myself making frequent and favorable comparisons to Jane Eyre and Wuthering Heights. Winter allows no questions but requires Lea to simply listen, and so the story unfolds. With each revelation, I found myself anxious to know what came next, and in the end I felt I knew each character as intimately as if they had been characters in my own life. I have always been a fan of the gothic literature genre, and I felt that that Sutterfield did an excellent job of writing in this style. In addition, the characters felt like living breathing people. I could imagine Lea’s parents and visualize the shop she worked in. Finally, the storyline moved at a well balanced pace that was just fast enough to keep the reader intrigued but not so much that the resolution was given away before the end. 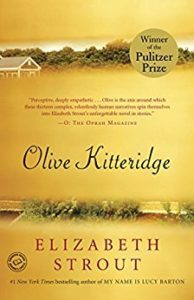 Olive Kitteridge by Elizabeth Strout is a Pulitzer Prize-winning novel told through a series of short stories. Set in the small town of Crosby, Maine, each story features a different character whose lives are gradually interwoven. Throughout the novel, the titular character, Olive Kitteridge, remains a central figure who is both revered and reviled. On the surface, Olive appears overbearing and even a bit uncaring. Her relationship with her husband has gradually become strained as they navigate the waters of realizing the person you married is not the person they have become. Henry remains a steadfast churchgoer while Olive has become an unapologetic atheist. Both enter into emotional affairs and struggle with honoring the committment they once made. Although she smothers her son Christopher and continually pits him against his father, Olive has little time for what she perceives as nonsense. The result is a woman who speaks her mind when she shouldn’t and doesn’t speak up when perhaps she should. While each story is not specifically about Olive, she does appear in each of them. As we learn each character’s story, we also learn more about the town and Olive’s impact on the people within. To some she is little more than a peripheral character, while to others she looms almost larger than life. Readers who enjoy works by authors such as Alice Munro or Joan Sibler will find similarities in Olive Kitteridge. In addition, Strout’s depictions of small town life reminded me of John Irving’s The Cider House Rules. The depictions of living in a small northeastern town reminded me of my own experiences growing up in a small town, and of stories my mother would tell of her childhood in Upstate New York. Strout’s characters are so real that the reader will be certain they’ve met some of them before. While I enjoyed the overall tone and storyline of the book, a couple of the stories felt thrown in for the sake of filling space. It is telling of Strout’s characterization that these stories are the ones in which Olive is a mere mention rather than a pivotal figure.